Similar Goddess sandals and wig sold separately. Staff not included. Cleopatra was known as the Queen of the Nile and while technically she was from Alexandria, she's often thought of as an Egyptian Goddess. 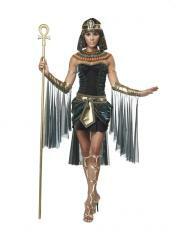 Attract the attention of a Pharoah or two in this gorgeous Cleopatra Costume.